In November, the residents of the State of Washington will vote directly on proposition I-1631 which would establish a pollution fee. Proponents of the initiative have stated the difference between a “pollution fee” and a “carbon tax” is that the fee must go directly towards funding solutions. Other US states have passed cap and trade systems but this would be the first carbon tax (or fee). In 2016, initiative 732, a previous carbon tax, failed to pass. The hope is that this stronger measure, 1-1631, has better chance of passing, because it directs proceeds to tangible solutions. As where 732 used the proceeds to simply lower the state’s sale tax, and was thus revenue neutral. Implementing a tax is always a difficult political fight, but outlining investments in renewable energy, clean air, and clean water could get us across the finish line. The concept of carbon tax and dividend is seen as a more bipartisan measure and has been steadily gaining popularity, in particular because of the Citizens Climate Lobby. However, in the progressive state of Washington, the grassroots are demanding stronger action and are putting in the organizational efforts to get it. 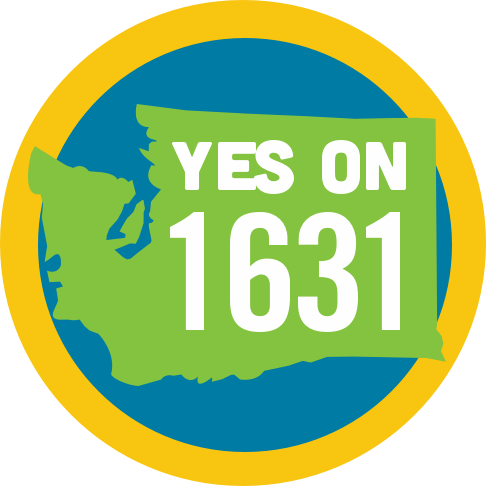 This I-1632 coalition is larger and more unified compared to 732. It is aiming to unite and excite the left. With the Trump administration attacking environmental action, individuals and groups are extremely motivated. Washington’s 2035 goal is to lower emissions by 25 million tons annually. 70% of the proceeds will go towards funding clean energy infrastructure, including but not limited to solar, wind, public transportation, and energy efficiency. Interestingly, it even would allow funds to improve rural broadband, with the expectation that it would decrease miles driven. 25% of the proceeds will go to clean water and healthy forest projects. The remaining 5% will go help communities prepare for the consequences of climate change. The initiative sets up a 15-person committee to oversee expenditures. According to ballotpedia.org, the initiative will raise almost $2.3 billion dollars over the first five years. The opposition has out-raised proponents of the bill by 3 to 1. The opposition has raised a total of $16 million, $13 million of which came from fossil fuel companies Phillips 66, Andeavor, and BP. In the age of social media and with online independent media, we can hope this financial lead can be eroded by truth and hard work of volunteers. To learn more about initiative or volunteer you can visit www.yeson1631.org. The website has clear instructions on how to phonebank for this initiative. If you are interested in other state initiatives, we covered Arizona’s proposition 127 and will be soon covering Nevada Question 6. Some final food for thought. 26 states and Washington D.C. allow voters to decide on ballot initiatives, but this election cycle only 3 states have initiatives related to climate change. Do you think we can do better?